The 4th Prince joins hands with a detective to investigate a case that leads them on a treasure hunt. The story takes place during the 19th century in the context of the Opium War that has left the Qing Dynasty at the mercy of internal and external threats. Within the Yang City in the South is a chilling case that involves the flesh being skinned from the victim. Bai Xueqing (Li Mozhi) is a hot-blooded detective who starts on a trail to investigate the truth but finds that her efforts are being hindered by the county magistrate. The 4th Prince (Wang Xia) who is outside the palace also starts on the same trail which leads them to uncover a big secret. 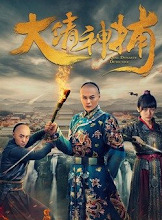 Bearing the will of the previous emperor, the 4th prince decides to go of his romantic feelings towards Bai Xueqing and decides to use the treasure to reestablish the Qing Dynasty. As Bai Xueqing and their friends have become sacrificial lambs, she decides to enter the palace to carry out an assassination. Let us know why you like Qing Dynasty Detective in the comments section. Please also share these fun facts using the social media buttons below.